We have been kindly donated a whole heap of OiDroids for our British Family Auction 2014 and a few to review. 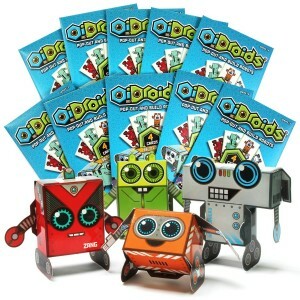 OiDroids are colourful pop-out and build robots of which there are currently 96 to collect. We have complained for ages about the lack of UK made toys. OiDroids are made in Britain but I must admit that I don’t class them as toys. 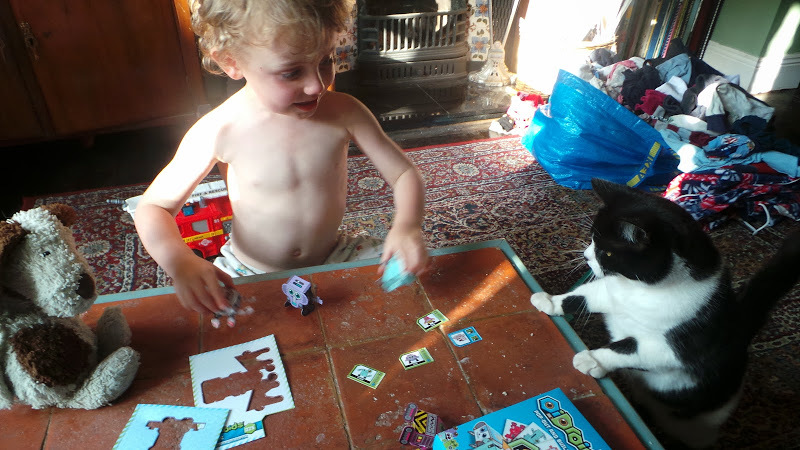 Like Carddies and Orchard toys they are activity based games rather than ‘toys’ but brilliant non-the-less. In fact, I was surprised at how much fun Lucan actually had with these simple little folding card robots. Even Patch the cat liked playing with OiDroids! Yesterday evening I opened a pack of 4 OiDroid cards and he loved them. I am not sure that, at 4 years old, he is actually the target audience but saying that he giggled for a full 30 minutes as we made the 4 robots together and to got them to have little conversations with each other. He even took them to bed with him! His favourite was a character called Snipz which is a brown crab-like bot with snapping claws. I can really see that kids between the ages of 7-13 might get dangerously obsessed with these things. The concept is simple. In a pack you get a certain amount of cards. On each card is printed a stunningly illustrated robot character, some information about that robot and a little pull-out card with that robots ‘Stats’ on it. The robot character can be easily popped out of the base card and folded into a 3D model and the stats card looks like it can be used as some sort of top-trumps game. Lucan’s delight at his OiDroids really surprised me. These inventors at Lunar Lime have obviously hit on something that might be big! Anyone remember how Pogs or Panini stickers took over your life at a certain point? OiDroids are poised to do the same to for the iPad generation. 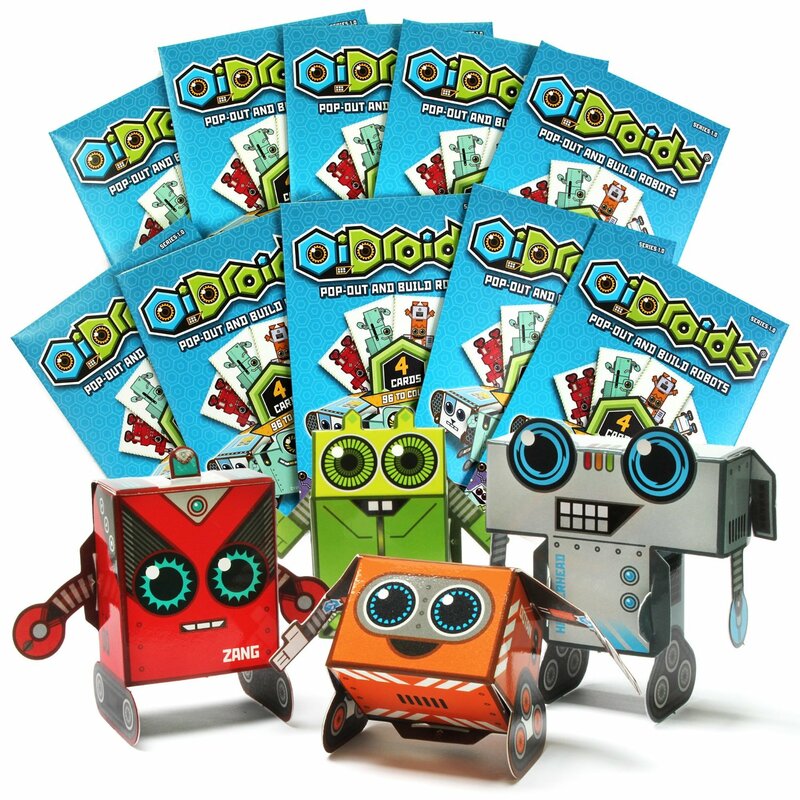 A pack of 12 OiDroids cost just £4.99 – which is pocket money level – and are available in WHSmith high street stores. There is even an app for free augmented reality downloads… whatever that means!?. Thanks again to Lunar Lime for donating a selection of OiDroids for our British Family Charity Auction at our British Family Fayre this year.